A power bank is an absolute necessity when commuting or travelling. They are easy to carry with you and most just fit easily into a pocket or handbag. They are not expensive, and once you own one, you will wonder how you ever managed without! As phones become more and more powerful each year, batteries have more work to do and will wear out more quickly over time. For extra battery power for your iPhone or Samsung device (or any other device), you will require a power bank, especially for travelling. You may think that power banks are all the same, but this is not the case at all. Various power banks capable of charging your device once, others with the capacity to charge two or three times and the high capacity banks that can charge over ten times. Power banks vary quite a lot of their inputs and outputs. You will need a Micro-USB cable to charge your power bank (which usually comes with the unit) and another cable to charge your phone if it does not support the Micro-USB connection when charging. Some power banks include carrying cables while others may have built-in cables and Micro-USB to Lightning adaptors. All the various capabilities will be discussed in each section so that you know exactly what you are getting. You will be able to check the benefits of using high-quality power banks in the descriptions listed. Smart Detect Technology: Automatic detection and delivers optimal charging current for any connected device rapidly. High Output: 4A unique output (2.4A+1.0A) can charge 2 devices at the same time. High Input: 2A input makes the charger recharge twice, faster than 1A input, which saves a great deal of time. Superior quality: Sandblasted surface, 180° circular arc side, gives comfortable and safer grip, more difficult to drop. Safest Protection: Premium Li-Polymer cell with multiple protection systems ensures safety from overcharging, short circuit, too much voltage or current. The Poweradd Pilot 2GS, 10,000mAh is a dual port portable power charger with external battery power bank for iPhone, iPad, iPod, Samsung & most other phones and tablets. The Lightning cable is not included in the package. The Colour name is Silver. The power bank needs to be fully charged before first use. It recharges the 2GS with a 2 amp output charger to maximize a charging speed of 6 hours. Use the cable included, your original cable or a third-party certified cable. This Poweradd Pilot has a 24-month limited warranty. It has a powerful battery life: 10,000mAh capacity with the Li-polymer battery cell. It has smart identification output to identify and deliver the fastest charge. The strong input current of 2A reduces charging time to only 6 hours which is a huge time saver. The compact design makes it easy to carry, and the long sides of the device are rounded which makes it easy to hold and difficult to drop. It is lightweight and long lasting due to the aviation aluminum body. The device is compatible with all types of Apple units (cable for Apple is not included) and Android smartphones, as well as other 5V USB-charged devices. This device gets the job done quickly and is ideal for traveling. The price is reasonable, and it is excellent value for the money plus it has a 24-month warranty which is longer than most. Auto-detect: Detects your device to ensure fastest charge speed with 2 A (maximum) output. 20,000mAh portable charger external battery power bank for iPhone, iPad, iPod, Samsung and most other phones and tablets. Huge Capacity: 20,000mAh which can charge an iPhone 6 or 7 times, a Samsung S6 more than 5 times and a large capacity of iPad Air 2 almost twice. High-Speed charging: 2A input enables the charger to recharge itself twice as fast as 1A input. Dual USB output ports can charge two devices simultaneously. Safety Protection: built-in Li-Polymer battery with the multi-protection system to protect against over current and short circuit. 24 Month limited product warranty. Lightning cable sold separately. The Poweradd Pilot X7 20,000mAh portable universal external power bank comes with an ultra long 24-month limited warranty. It is black, very stylish and easy to grip and carry. It has 4 LEDs which will let you know the battery’s status as well as the status of charging. This Powerad Pilot 7X power bank comes with a longer than usual 24-month warranty. It has Power SI Technology which means it identifies your devices and then delivers the most rapid charge speed. The unique 2A input is twice as fast as 1A input which saves precious time. It uses grade A 18650 battery cells which are of excellent quality, safe and effective. You will need to fully charge the power bank before first use for best performance. Recharge your Pilot 7X with a 2amp output charger for maximum speed (10 hours). You should use the cable included, your original cable or a third-party certified one. The most frequent complaint is that the power bank is a little heavy, but this far outweighs the pros. This product is an excellent purchase. It has a superb finish and can charge several devices at once. It lasts for ages and has an excellent mAh ratio and huge capacity. We recommend it highly. The Anker Power Bank Astro E1 5,200mAh Ultra Compact Portable Charger is small enough to carry in your pocket and is of superior quality. It has charging bars or LEDs on the side to indicate the status of the charger. Included is a USB to USB micro charging cable which can be used to charge the device from a USB port or mains with a USB charger. It has all the up to date technology as indicated in the description below and comes with an 18-month limited warranty. The Astro E1: Anker’s Classic Portable Charger has exclusive Power IQ Technology which detects your device to produce the very fastest charge speed of up to 2 amps (4 times faster than a computer USB port). It does not support Qualcomm Quick Charge. It has a high capacity which can add over one and a half charges to an iPhone 7 or 6s, one full charge to a 7 Plus, Galaxy S7, Nexus 5 or other smartphone or 80% to an iPad Mini 3. This device is extremely compact, the size of a small bar of chocolate. It recharges in 5 hours with a 1A adaptor (not included) and the included Micro USB cable. Only premium battery cells are used with superior materials and cutting-edge technology to guarantee complete safety. There have been no negative reports to date on this product. You certainly won’t regret buying this item; it does the job fast and efficiently, is easy to carry around with you anywhere you go. The price is right, and there are no negative reports at all. Go out and buy it is our advice. The iMuto Portable Charger 20,000mAh is black in colour and of a high capacity and compact size. Its smart digital screen shows remaining power in digital format which is hidden until activated. The iM power technology detects your devices intelligently and makes for faster charging. It is eco-friendly and affordable with high quality guaranteed. This product has the high capacity with 20,000mAh, the Taurus X4 is even smaller than an iPhone and can charge the iPhone 6 almost 8 times, iPad Air nearly 1.7 times, Galaxy S6 almost 5.7 times. The smart digital screen shows remaining power in digital format. The battery bank fits almost all USB powered devices. iM Power Technology means that both USB ports can detect your devices, providing a faster charge. With the 2 USB ports (2.1A & 1A) you can charge two devices simultaneously. There is also a LED torch for your convenience while camping, in a blackout or just in the dark. The multiple smart protection systems ensures your devices are protected from over-charging, over-voltage, over current and short circuit. There have been no customer complaints to date on this item. This product is highly recommended – it is extremely fast charging and very powerful, perfect for long trips with its high capacity. A definite bargain and well worth every penny. Anker is America’s leading USB charging company with over 10 million happy users. The Anker PowerCore 10,000 is extremely compact, light and can provide almost three and a half iPhone 6s charges or three Galaxy S6 charges. It is very high speed at charging with unique PowerIQ and VoltageBoost. Qualcomm Quick Charge is not supported. The Anker PowerCore 10,000 is one of the smallest and lightest on the market, just the size of a pack of cards. It is an ultra-compact, high-speed charging power bank for iPhone 7/Plus/6/6s/SE, Samsung, Galaxy and more. It is certified safe by Anker’s MultiProtect safety system which gives complete protection for your devices. It is compact with high capacity charging abilities and VoltageBoost technology for up to 2.4 amps. Anker uses only the very highest quality chips and hardware to guarantee cutting-edge technology, and they give an 18-month warranty. No complaints, customers are highly satisfied with this product. The compact size of this device makes it easy to carry around wherever you go. It does the job well and is reasonably priced. What more could you wish for? The Anker PowerCore 20,100 has been upgraded from the 16,000 PowerCore and can charge an iPhone 6 seven times, the Galaxy S6 five times or the iPad mini twice. It recharges in 10 hours with a 2 amp charger. It is incredible value for the price, ideal for traveling as you can do a huge amount of charging before it runs out of battery. It is difficult to find a better power bank on the market. 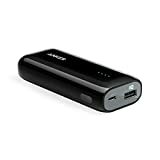 The Anker PowerCore 20,100 is a high-speed charging, long lasting, portable power bank with Power IQ and VoltageBoost which can recharge itself in 10 hours. It is certified safe by Anker’s MultiProtect safety system which gives full protection to your devices. It has the ultra-high capacity and can charge an iPhone 7 almost 7 times, a Galaxy S6 5 times and an iPad Mini twice. This unit has a huge 4.8A output so that it can simultaneously charge any combination of devices at full speed. The MultiProtect safety system guards against short circuit and more advanced safety lines to keep you and your devices completely safe. It has a matt finish which makes it easier to hold and doesn’t leave fingerprints or smudges. Use the included cable, your original cable or a third-party certified one. It is compatible with most devices except the iPod nano, iPod Classic, HP TouchPad, Dell Venue 11 Pro, Asus tablets and some GPS & Bluetooth devices. Lightning cable for iPhone/iPad sold separately. Some customers found the unit slightly bulky to put in your pocket but easily carried in a bag. With such powerful output, this power bank is an absolute necessity when traveling. It is reasonably priced and does exactly what it claims to do. It may be a bit larger but is one of the best power banks on the market and an excellent buy. High capacity: Contains 5,000mAh which can provide two charges to an iPhone 6s or at least one to a Galaxy S7. The PowerCore 5,000 is an ultra-compact portable charger with 2 high-speed phone charges fused into a cylindrical shell which fits neatly into your pocket. It is fast and safe and has at least one complete charge for any phone. It is perfect for work, home or travel. This tubular shaped power charger is ultra compact and light. It is fast charging, and the Power IQ gives a more rapid charge to any device up to 2A. VoltageBoost increases the output to overcome cable resistance and gives a consistent top speed charge. It is secured with MultiProtect safety system to prevent surge, short circuit, and other advanced safety features to protect you and your devices. This sleek design is as easy as carrying a lipstick around, very light and fits into any pocket. It does a good job and has a 3 level indicator to show the status of power. It is a very reasonable price and is fast and reliable. You cannot go wrong with this product. The Kinps 25,600mAh Portable Charger External Battery Power Bank is suitable for iPhones, tablets, Samsung Galaxy, Android devices and more. It has an aluminum case with newly designed appearance and is compact for easy one-handed operation. It is excellent for travel, work or home and can keep your devices going for days. It can charge an iPhone 10 times, iPhone 6 plus 6 times, Galaxy S5 7 times, iPad mini 2, twice and other smartphones multiple times. The ultra high capacity 25,600mAh external battery has more energy to charge your devices simultaneously in one charging period. This item comes in a smart aluminum case. It has smart technology with an output of maximum power up to 2.4A per port. New features provide a higher level of safeguard against overcharging & short circuit, etc. Some customers found that the power bank itself takes the time to charge, but this is due to its enormous capacity. Once charged it could last for ages. Others found it a bit large for a pocket. We agree with the majority of satisfied customers that this is a great power bank with a huge capacity. It is smart to look at and has the smarts to go with it! We think it is an excellent buy. The HJGD Ultra Compact 10,000 mAh portable charger power bank comes in an amazing array of beautiful designs. It has a nice soft texture with rounded edge casing. It is very small, just the size of a credit card, although it is a little heavy at 181 g. It is one of the UK’s top rated power banks according to PC Advisor 2017- in the top 5. This Portable 10,000mAh charger power bank is one of the smallest in the world. It has high-speed charging: A1 power technology which acts to deliver the fastest charge for your device intelligently. It is 100% safe with cutting edge circuit protection to guard against overheating, overcharging and short circuit. This gives both you and your devices full and reliable protection. Please note the Apple lightning adaptor is an optional extra. Some customers found the power bank a little heavy despite its very small size, but it is still easy to carry around. This is one of the very smallest and best power banks on the market. The designs are unique and attractive, and it charges at high speed. It is the ideal travel companion and an excellent choice to purchase. It also makes a nice gift. Intelligent power display with auto-shut down. Dual USB ports suitable for all kinds of devices. The ToHLo Ultra Slim Portable Charger Power Bank has a fashionable, slim look and is easy to carry in your bag. It makes an excellent gift for a friend or yourself. It has a nice texture which is easy to hold and difficult to drop. It provides 3A output and can charge your phone in an hour and a half. This power bank has dual USB ports and is suitable for charging iPhone 7, 6 Plus, 5s, Samsung Galaxy, S7, S6, S5, Sony, HTC and most Smartphones & tablets as well as iPod, MP3, MP4, PDA, GPS, Bluetooth, digital cameras, etc. It smartly identifies your devices for faster charging. It has a high-quality polymer battery, built-in proprietary software to control and regulate temperature, voltage, and current. It has intelligent power display, no load, auto-shut down. 4 LEDs show the status of battery and charging. The power bank is not full due to safety reasons, please fully charge before using for the first time. When the power is less than 20%, you should charge fully. If you cannot recharge the power bank, click the power button or replug the cable to activate the unit. Some customers found the power bank a bit too large to carry in a pocket, but it easily fits into a bag. This power bank is ideal for traveling, camping, home or at work. It is a high-speed charger, and the best thing is that it is compatible with so many different devices. It also looks good, and the rubber cover gives it a firm grip. It is well worth the money, a good buy in our opinion. A power bank is an absolute necessity when traveling, particularly in remote areas or while camping. They are easy to carry with you and most just fit easily into a pocket or handbag. You can usually charge several devices simultaneously and quickly depending on the model you choose. Some even have solar panels which can be used absolutely anywhere. They are not expensive, and once you own one, you will wonder how you ever managed without! You should naturally make sure the power bank you are purchasing is compatible with your devices. Note that Apple cables and lightning cables are not included with any of the products listed below. In general Qualcomm Quick Charge is not supported. You should work out how many devices you wish to charge simultaneously to be sure to buy the right power bank to do the job. Check how high the input is which increases the speed of charging. Some models have passthrough charging, which means you can charge your iPhone at the same time as the power bank. The auto-on/off is another feature to look for although sometimes the power bank will support this, the phone simply won’t. With this feature, you can plug in your phone or another device, and the power bank will immediately start charging and when complete, goes into standby mode. Note that due to safety reasons the power banks are not sold fully charged so you need to do that before first use. Make sure that the size and weight of the unit are what you are looking for and also check as some are waterproof and some just rainproof. These are small points but will save disappointment after purchase. Last but not least, check on the warranty as some are for 12 months or 18 or 24 months.